Xi Jinping is China’s most powerful leader in decades. What are his plans for the country—and the world? How much control does Xi have? The son of a revolutionary leader who fell out of favor with Mao, Xi was sent to the countryside at age 15 for re-education during the Cultural Revolution. Xi spent seven years living in a cave home but survived the upheaval by embracing the party. He became “redder than red,” said a Chinese academic who knew him as a young man. 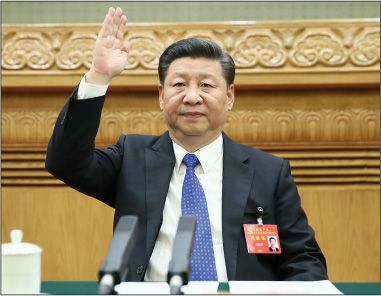 Xi climbed the ranks and in 2012 was chosen as party leader, just as officials were growing nervous about their hold on the people. Party bigwigs were alarmed by the so-called Color Revolutions in former Soviet Republics and by the Arab Spring uprisings, and feared that Chinese citizens might also take to the streets. They had plenty to protest: Revelations that some officials had looted state resources to the tune of billions of dollars were ricocheting through still-new social media networks. Waving the banner of anti-corruption, Xi had thousands of officials arrested. The purge destroyed his rivals’ power bases, giving him nearly total control of the party. How did he use that power? To prevent a democratic groundswell, Xi shut down civil society organizations and rounded up human rights lawyers and bloggers. He then cemented his authority by appointing allies to key posts: The seven-member Politburo Standing Committee, the nation’s top political body, is stuffed with his cronies. Technology has given Xi and the party new Big Brother–like control over the lives of ordinary Chinese. Practically everyone in the country is under surveillance through WeChat, a “super-app” with 1 billion accounts. Users do everything through the app: pay bills, schedule doctor’s appointments, post photos, apply for jobs. Conversations on WeChat are automatically censored; any reference to a sensitive topic such as Tiananmen Square or Tibet is blocked. Starting in 2020, the party will assign each citizen a “social credit score,” based on data culled from WeChat and other apps, that will determine their eligibility for a mortgage, whether they can travel abroad, and more. What are his economic policies? Xi is not a reformer. The party has always had a large presence in state-owned enterprises, but that control has become more explicit under Xi. Most companies have a party committee, and at the big state oil companies, telecom firms, and weapons manufacturers, the head of that committee is now also the chairman of the board. Most major foreign companies in China operate through joint ventures with state enterprises, and Xi has been pushing for more party control in those as well. But it’s doubtful increased centralization will sustain economic growth. While the economy expanded rapidly over the past three decades, averaging 10 percent growth a year, it started to slow in 2015. Bloated state industries are now being propped up by nearly unlimited loans from state-owned banks. Does he have a foreign policy vision? Can one-man rule work in China?